Camp Boost is kind of personal to me. It’s personal partly because I have a couple kids of my own. They’re school age now, and I’ve experienced firsthand how simple it sounds but how critical it is – and how HARD! – to get your kids to read over the summer. I’ve also realized how much as a parent you want your kids to have fun enrichment opportunities. Music lessons, sports, camps, traveling, all of the things that broaden your horizons and spark your interests – things that seem like fun to a kid, but are developing their brain in really important ways. See, kids in poverty – and I mean Springfield city kids – aren’t taking music lessons, or playing sports, or even going on vacation. Their horizons aren’t being broadened. Their interests aren’t being sparked. And they’re not reading during the summer. So guess what Camp Boost Summer Reading Clubs are about? They’re about reading, and they’re about enrichment, and they’re about getting kids of ALL backgrounds engaged in summer reading and enrichment. Each child gets to choose a club that sounds interesting to them and become absorbed in it for five days. Last summer my daughter learned about dogs, and my son learned about superheroes. (Surprise!) Other kids will learn about food and cooking, or put on plays, or draw their own comics. We at SCYM believe that there are simple things – like summer reading and summer enrichment – that can collectively make the difference for kids in poverty. And we are determined to help engage the church to do those simple things. That is what is happening at Camp Boost. 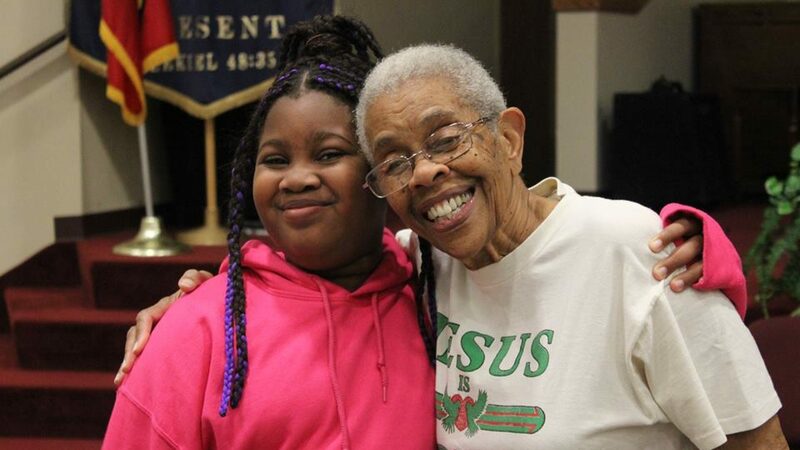 Last summer 128 volunteers at three Springfield churches gave a total of 219 kids five days of Camp Boost. It takes all hands on deck! Why not join the team this summer, and who knows? Camp Boost may become personal for you, too. High Street Nazarene and St. John Missionary Baptist Church will be holding their Camp Boosts on July 6-10 and July 27-31, respectively. 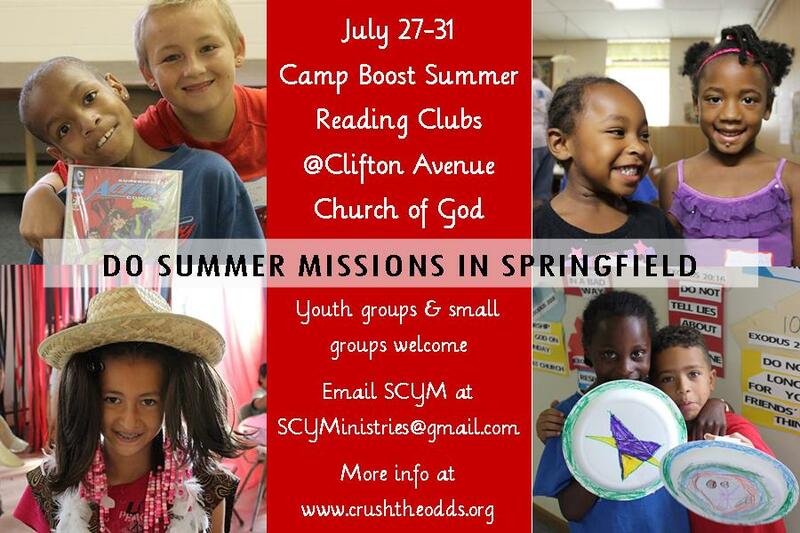 Clifton Avenue Church of God will be hosting a community Camp Boost, with a team of people from all over the city, on July 27-31. UPDATED: For all Clifton Camp Boost team members, there will be two volunteer meeting options, on Thursday June 18, from 10-12 or Tuesday, June 23, from 10-12, both at CACOG (1408 Clifton Avenue.) We hope to see you there! Count us in, if needed, at both East High and Clifton Ave.
I’d like to help at Clifton Ave. or St. john’s but already have a commitment for work on Friday, so I could only be there 4 days. Would that be okay? Hi Linda, we’d love to have you, and we can work with 4 days! We’ll email you with the volunteer training dates. Thanks so much! Volunteering for Clifton Avenue. If 2nd grade (or around there) is still open, I am your go to gal!! I will be able to be there all 5 days as far as I know now. Looking forward to serving!!! Yeah, Deb!! We would love to have you! We’ll email you with details.